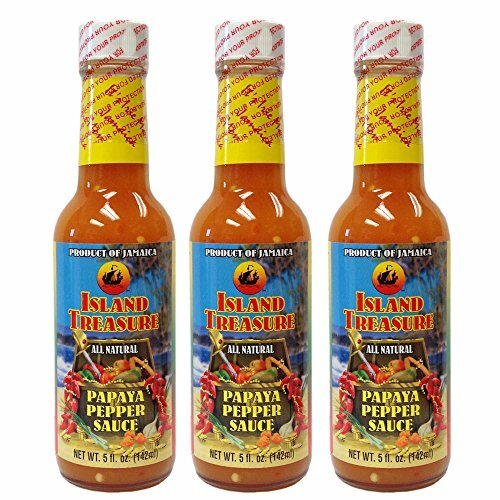 ISLAND TREASURE PAPAYA PEPPER SAUCE 5oz (Pack of 3) is an award winning true, ALL NATURAL hot pepper sauce made in Jamaica. This hot sauce is made from sweet Jamaican papaya fruit and spiced with habanero peppers, onions, vinegar, and other spices. It is marvelous with all types of foods, meats, fish, and poultry, adding true magic to any dish. If you have any questions about this product by Island Treasure, contact us by completing and submitting the form below. If you are looking for a specif part number, please include it with your message.